SiriusXM’s Elvis Radio (channel 19) has created and produced a series of special music programs celebrating 80 years of Elvis Presley, the King of Rock & Roll! Key figures in Elvis’ life like Jerry Schilling, one of Elvis’ closest friends, recently hosted a guest DJ show LIVE from Elvis Radio’s Graceland studio in which he played his favorite Elvis records while sharing personal memories from his time working for the King. Renowned Elvis historian and author, Peter Guralnick, also recently stopped by the studio to host a two-hour guest DJ show discussing the earliest sounds of gospel and R&B which influenced Elvis’ musical tastes and interests. SiriusXM’s Elvis Radio also will broadcast themed music specials for Super Bowl Sunday, Valentine’s Weekend, and the start of the NASCAR 2015 season at Daytona, as well as conversations with authors of newly published Elvis biographies through the spring. 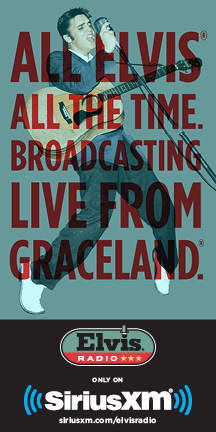 In addition, Elvis Radio features a weekly live Elvis concert in its entirety every Friday at 8 p.m. ET, with multiple replays the following week.